Coffee tables are more than pieces of furniture that occupy the center of the living room. They can make all the difference in design, functionality, and space. A good coffee table serves as a useful component to the time you and your family spend in the living room together lounging, reading, eating popcorn while watching a movie, or screaming at the television during a big game. Whether you want your coffee table to be a place where you display photos, store reading material, rest your feet, or serve as a piece of art, agreeing on the functionality of the coffee table is important. Families who spend a large majority of their time in the living room should consider a table that is good for eating and drinking. You’ll want a table that comfortably fits glasses, plates, and board games. Ideally, one that is spacious enough for snacking and dinners — think popcorn bowls and pizza boxes. 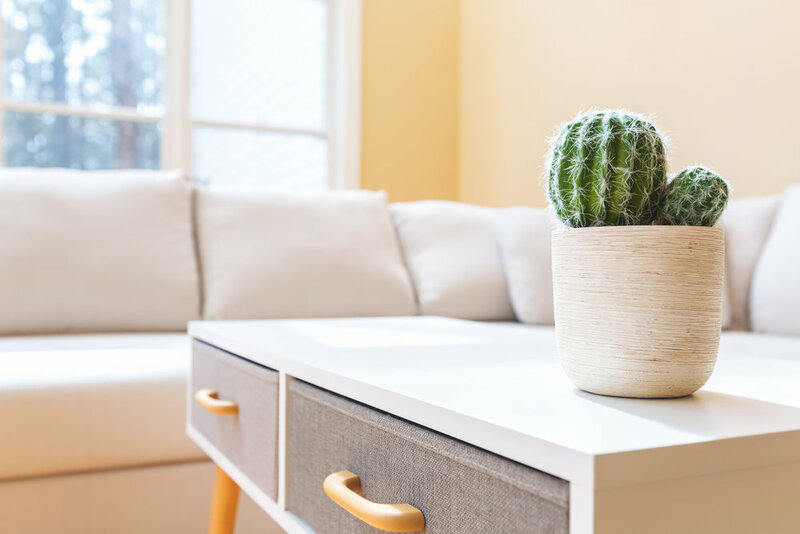 If you’d rather have the table be a place to display flower vases and coffee table books, then you may want to consider one with storage space such as drawers or a bottom table or section where you can easily store remote controls. Tip #2: Match Your Style. You’ll want your coffee table to blend in with the rest of your home. This includes color, texture, shape, and style. If you already have end tables, keep those in mind as you’ll want to match their color and material. Since the coffee table is placed in the center of the living room, it should complement everything around it. We suggest taking photos of your living room with your cell phone so when you come in we can find the perfect one. If you’re shopping for a set of new furniture, then it makes it possible to explore styles. A few styles to keep in mind include rustic, mid-century, country, and traditional. Tip #3: Keep the Kids in Mind. If you have children, you should ultimately consider the safety of your children around the table. Coffee tables with sharp edges can be dangerous if your children are small and still learning how to maneuver around the home without running into things. We suggest looking at round-shaped tables. You’ll want to avoid glass tops or designs that have sharp edges on the feet. A wooden, round-shaped table is your best bet. Tip #4. Measure Your Space. Professional interior designers recommend that the ideal distance between your sofa and coffee table should be 18 inches, close enough for you to grab items, and within distance to comfortably stretch out your legs. The common mistake that home furniture shoppers make is buying a table that’s too small or too large to fit in the living room. Prior to shopping, measure the distance of the room between the sofa and television, which will give you a good idea of how the table will fit. It’s also a smart idea to have someone measure the height of your feet when sitting on the sofa and elevated. Find the Right Coffee Table Today. We have a variety of discounted coffee tables to meet your needs. Come visit us today to see our wide selection of wood, glass, metal, and stone. One of our friendly sales associates can help guide you in the right direction.